Right from the start of life we are given healthy feet, but problems with development and the abuse which people subject their feet to later in life by wearing inappropriate footwear (this includes hosiery as well as shoes), gives rise to the staggering statistic that somewhere between 75% to 80% of the adult population have some form of foot problem. Unfortunately they frequently do not seek advice about them until irreversible problems develop in middle age. Clearly care in the early formative years is vitally important and can save many problems in adulthood. The foot is truly a marvel of biological ‘engineering’ and something of its complexity can be understood by realising that the bones of the feet make up an eighth of all those in the body. The foot is capable of propelling the body and protecting it from mechanical shocks and stresses throughout life. 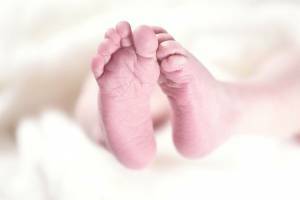 At birth and throughout the first year or so of life, babies’ feet are quite different in many ways from those of an adult. Firstly they are a different shape, being wider in the forefoot and narrow at the heel with the toes often being “curly”. Secondly the bones are undeveloped and at this stage consist of nothing more than cartilage, so they are soft and pliable. This is why small children can appear to do things to their feet without any harm at all, which would certainly injure an adult. The 26 bones in each foot gradually develop throughout the early years, becoming basically bony by the age of 7-8 years, at which point the toes have usually straightened. However, they are not fully developed until the late teens. You should continually monitor the fitting of socks and particularly, the all in one sleep suits that are popular. If they begin to look even slightly restrictive, either change them for the next size up or cut the toe part off so the feet can grow uninhibited. Bedclothes can be restrictive to a baby’s feet, so ensure they are not tightly tucked in, if at all. Nails should be trimmed straight across and not too short. Parents sometimes worry about baby’s nails curling around and following the contours of the toes. This is quite normal in the early months and due to the thinness of the nail. They will soon toughen and develop a more conventional free edge. Never cut down, or probe, into the sides of the nails. This is a great moment for the parents and no doubt a sense of achievement for the infant too. Resist the temptation to rush out and purchase the first pair of shoes! Baby’s feet are flat and broad and at this stage, designed to function barefoot. You should not force the child to walk too soon. They will do so when good and ready and the age varies quite a lot between individuals, with the first independent steps occurring between 10 and 18 months, even later than this does not necessarily imply that anything is wrong. In the early stages of walking, shoes are unnecessary. In fact it is desirable to allow baby to walk barefoot and thus strengthen the muscles in the feet. Obviously make sure there is nothing on the floor which could injure the feet and ensure the area is clean to minimise the risk of infection. 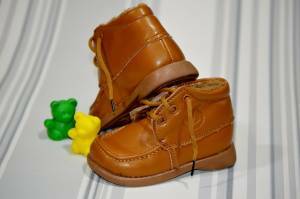 Once baby is ready to walk outside, the protection of shoes becomes necessary. Buy a good quality shoe, with the uppers at least, being of leather. Make sure socks fit well too. As said before, too tight will be restrictive, and too loose could ruck and also cause problems. Always allow a sensible amount of room in footwear for future growth. The Foot Health Council publish a booklet called “The Children’s Foot Health Register” which lists all the shoe shops throughout the country who are committed to the highest standards of shoe fitting for young growing feet. This includes a staff of properly trained shoe fitters who will be able to advise on suitable styles as well as size and fitting. Children’s feet are very flexible and not too sensitive so they often do not complain of areas of pressure or friction. It is therefore important to check their feet regularly (bath time is often best). Because foot growth occurs in spurts you should have the feet checked for size and fitting every 6-8 weeks in the early years (and do not forget the socks too!) A good shoe shop will not mind you presenting a child for measurement checks, shop at off-peak times when the staff can spend more time with you. Never rush the process of purchasing shoes. Parents are often concerned because their baby appears to be walking flat-footed. In the early stages of development this is quite normal and gives them a more stable base until the legs and feet have gained strength. If the flat-footedness appears to persist in a young child to the age of 5 or 6 and is apparently causing problems, consult your chiropodist/podiatrist/foot care professional who will be able to advise whether appropriate exercises or corrective insoles might be required. Toeing in and toeing out can sometimes cause problems. If your child seems to trip over rather more than normally, then observe them walking and see if they appear to be toeing in. If they do so, consult an expert to correct this either by exercises, a corrective insole or a simple modification to the shoe. Sometimes these difficulties lie in a variation in hip development and referral to a Paediatrician or Orthopaedic Consultant may be required. Your chiropodist/podiatrist/foot care professional will be able to offer appropriate advice.